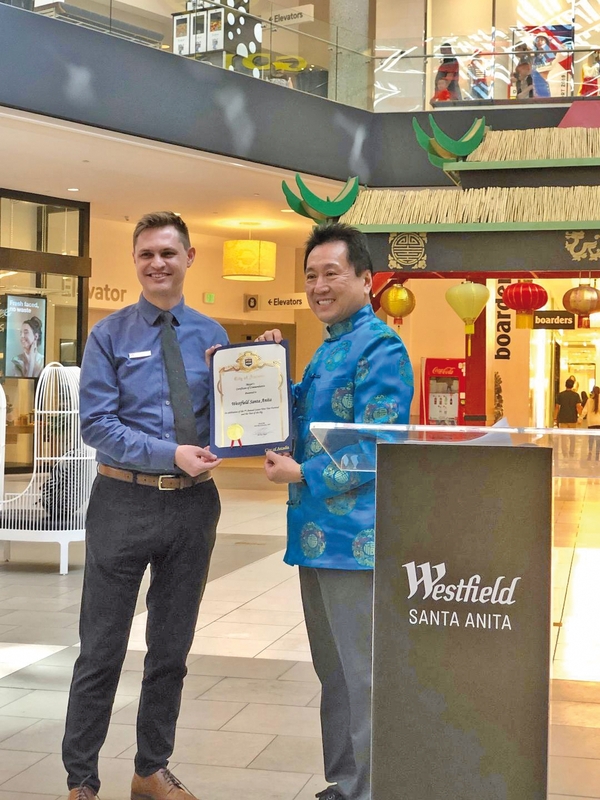 IN anticipation for Lunar New Year on Tuesday, February 5, Westfield Santa Anita is hosting its seventh annual celebration on Saturday, February 2, with an afternoon for the entire family and a month of activities and specials. Westfield Santa Anita’s Lunar New Year public event from 3 p.m. to 6 p.m., celebrates the “Year of the Pig” at the Center’s outdoor Promenade and will consist of a day full of festivities that put a modern twist on the Center’s annual event. 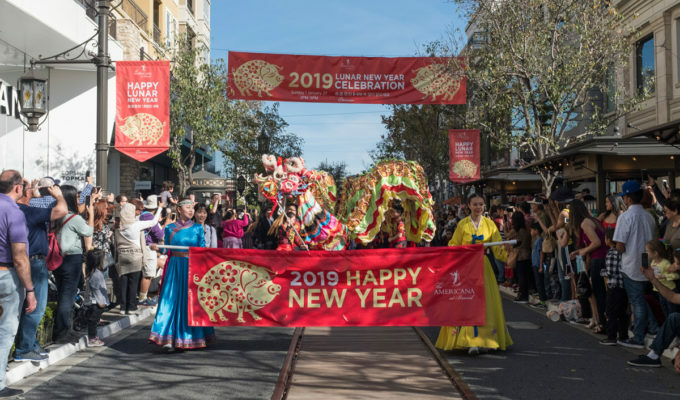 The celebration includes a live concert of contemporary performances and entertainment, Lion dances, children’s crafts activities, stunning photo opportunities, as well as fantastic promotions and treats from the Center’s shops and restaurants. On Tuesday, January 29, members of the media and community partners were given a look into what the public can expect during this year’s festivities as well as the offerings throughout the month of February. 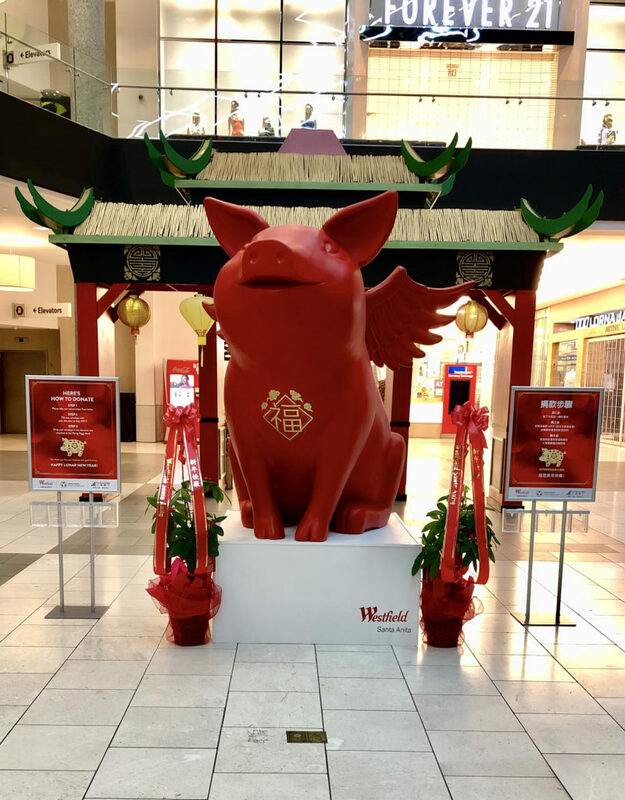 Leading up to the grand community celebration, Westfield Santa Anita has placed a larger-than-life “flying piggy bank” statue designed and produced by artist David Flores in the center atrium. It was revealed on Saturday, with Mayor Sho Tay, Chun Yen Chen of APCF, and Nicholle Brang of Nordstrom giving the first donation. Arcadia Mayor Sho Tay, Chun Yen Chen of APCF, and Nicholle Brang of Nordstrom giving the first donation to the “flying piggy bank” statue at the Westfield Santa Anita. 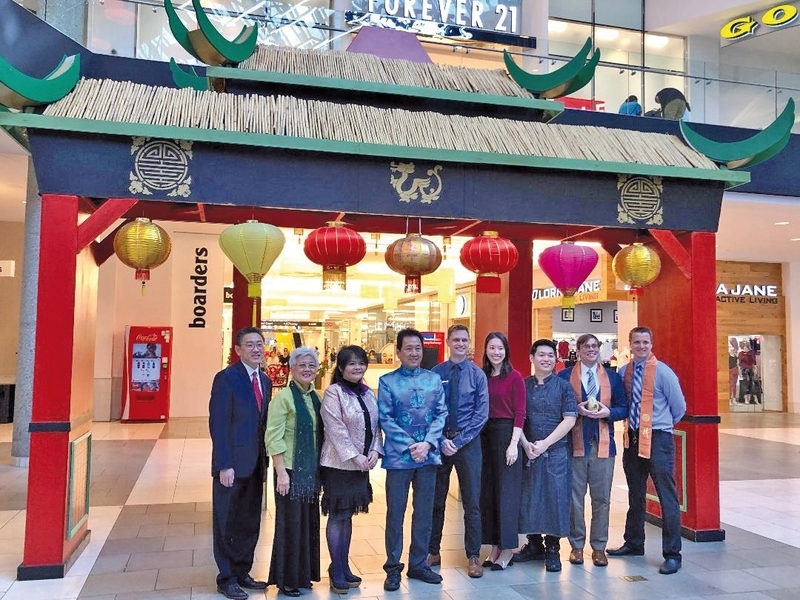 In the spirit of giving, the statue also serves as a donation box where shoppers can donate proceeds to the Asian Pacific Community Fund (APCF). First General Bank will match all donations to APCF as a gracious homage to the Lunar New Year season up to $5,000. “In addition to our standard offering of amazing food, dining, entertainment and shopping, we bring in special activations throughout that period with discounts from some of our retail partners,” Carter said. 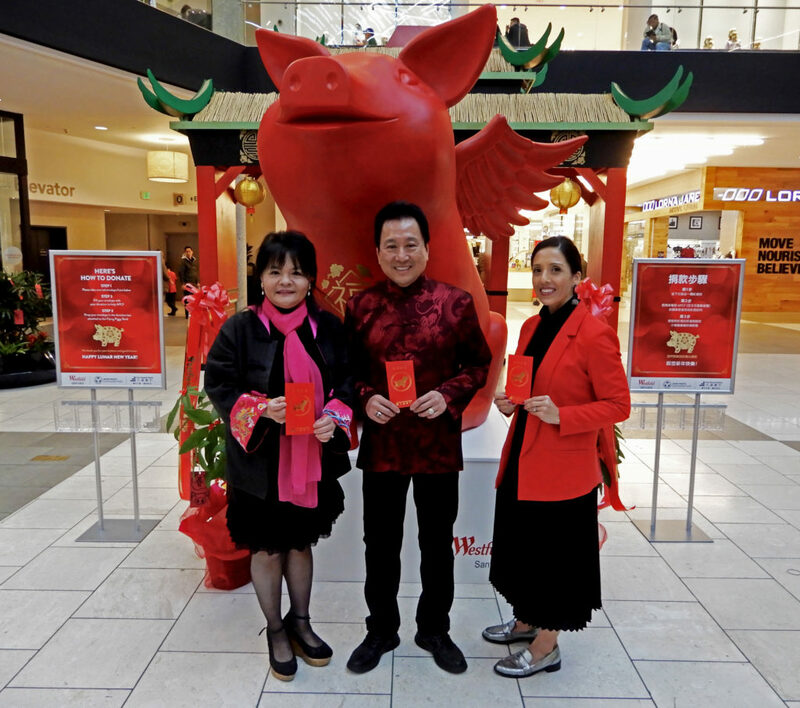 On February 2, Westfield Santa Anita is distributing complimentary red envelopes at their registration table during the community event. They would also like to introduce this year’s Gift with Purchase promotion, running from February 4-6, 2019: $100 Westfield Reward Card if you spend $1,000 or more; $150 Westfield Reward Card if you spend $1,500 or more; $200 Westfield Reward Card if you spend $2,000 or more. For more information, please visit Westfield Concierge located on Level 2 by Center Court. • JINS is offering $8.00 and $18.00 off coupons inside Westfield’s red envelope, redeemable at the Westfield registration table during the community concert event. • Macy’s is hosting a Cosmetic Department Gala with Smile Direct from 11 a.m. – 6 p.m. In addition, various brands within Macy’s are participating in Lunar New Year-related gift with purchase deals. • 1-5 p.m.: Complimentary Chinese Calligraphy with a qualifying purchase of $50 or more (one per customer, per receipt, as time permits). • Beauty Master Classes hosted by La Mer (11 a.m. – 12:30 p.m.), Lazlo (11 a.m. – 12:30 p.m.), Shiseido (1:30 p.m. – 3 p.m.), Chantecaille (4 p.m. – 5:30 p.m.), Estee Lauder (4 p.m. – 5:30 p.m.). • Party with is launching two Lunar New Year rooms, including a golden pig with gold envelopes and a Chinese red lantern rooms. 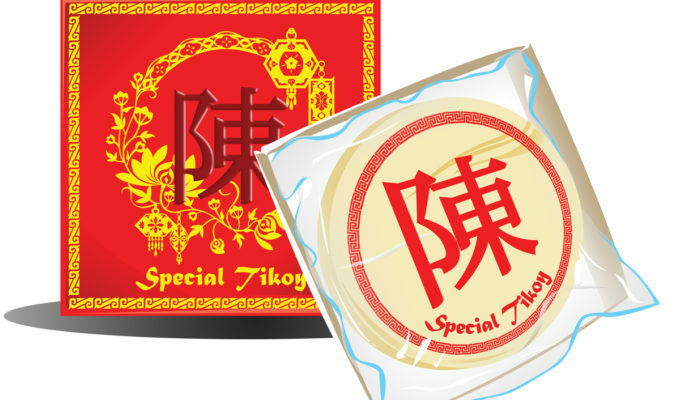 On February 2, the retailer will be distributing red envelopes with redeemable coupons. • Sugarfina unveils their new Lucky Pigs Lunar New Year Collection available for purchase. • Sulwhasoo is finally joining the Nordstrom family at Westfield Santa Anita. As Asia’s top skincare brand with the #1 serum, the Sulwhasoo First Care Activating Serum is being released in a luxurious Lunar New Year limited edition version on February 7. • Join Sulwhasoo at the Grand Opening Event at Nordstrom on 2/23 from 12-5pm to experience the magic of a traditional Sulwhasoo facial and application techniques. Please contact the Sulwhasoo counter at (626) 821-6363 Ext 1030 for more details. • Uncle Tetsu is introducing a new flavor cheesecake, which will be unveiled on February 2. This special edition flavor will only be available at Uncle Tetsu’s Santa Anita store for a limited time (month of February only). •Wing Hop Fung would like to say: “May the Lunar New Year bring you good health, joy, and time to celebrate with loved ones. Enjoy teas, Asian delicacies, wine and spirits from Wing Hop Fung for all your gifting and celebration needs.” Customers can save up to 40 percent on select ginseng, 20 percent on all loose tea, and up to $200 off on bird’s nest.